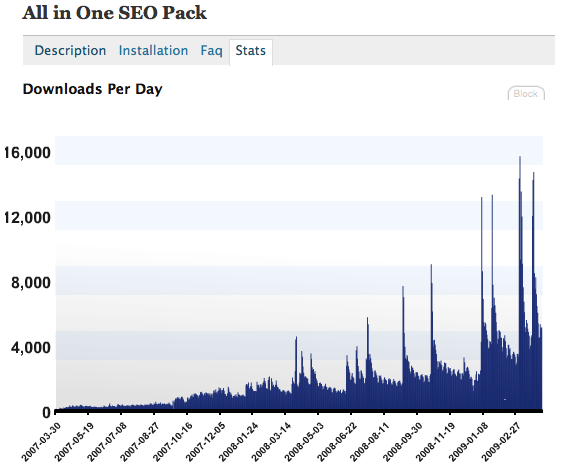 All in One SEO Pack is another my favorite WordPress Plugins, this plugin so genious and useful. I was tried in my several blog and running without any worries. This plugin is the right solution for you WordPress blogs. Easy to Install and easy to configure, make All in One SEO Pack is the right solution. You can download All in One SEO Pack on WordPress Plugins area. This plugins have a tagline Optimizes your WordPress blog for Search Engines (Search Engine Optimization). This plugin really popular, you can check on the download stats below. Yoast author of many (more than 20) WordPress Plugin released another useful plugin, this plugin called WordPress SEO. WordPress SEO us a plugin to optimize your WordPress blogs easier than ever. WordPress SEO built in support with breadcrumb, sitemap xml and many more. It is a great plugin,thanks for providing the download link. anybody suggest me how can i download all in one seo plugin for blogspot.com????????? ?